Born: June 5, 1807, Leeds, England. Died: March 25, 1889, Clifton, England. Buried: Arno’s Vale Cemetery, Bristol, England. 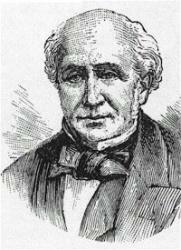 Rawson, George, was born June 5, 1807, at Leeds, in which town he practised for many years as a solicitor. In 1853 he assisted the Congregational ministers of Leeds in the compilation of Psalms, Hymns, and Passages of Scripture for Christian Worship, a volume commonly known as the Leeds Hymn-book. Mr. Rawson was a member of the Congregational body. In 1858 he also assisted Rev. Dr. Green and other Baptist ministers in the preparation of Psalms and Hymns for the use of the Baptist Denomination. A number of Mr. Rawson's own compositions first appeared in this and in the Leeds Hymn-book In 1876 he published his Hymns, Verses and Chants (Hodder and Stoughton, London), including his previously published hymns, and containing (exclusive of chants) 80 original pieces. In 1885 most of these, with several additional hymns, were published by the R. T. S. under the title Songs of Spiritual Thought. Mr. Rawson died March 25, 1889.
i. From the Leeds Hymn-book, 1853. 1. Captain and Saviour of the host. Burial. 2. Give dust to dust: and here we leave. Burial. 3. God the Lord is King-—before him. Ps. xcix. 4. In the dark and cloudy day. Consolation. 5. Soul, thy week of toil is ended. Saturday Evening. 6. Though the night be very long. Resignation. ii. From the Baptist Psalms & Hymns, 1858. 7. Beautiful, desired, and dear. Public Worship. 8. Blessed are they who have not seen. Faith. 9. Blessed is the faithful heart. Faithfulness. 10. Christ to heaven is gone before. Ascension. 11. God the Father, be Thou near. Evening. 12. He fell asleep in Christ the Lord. Burial. 13. Immersed beneath the closing wave. Holy Baptism. 14. Lord, we bless Thee, Who hast given. Holy Communion. 15. My Father God, with filial awe. Abiding in God. 16. Our eyes we lift up to the hills. The Lord the Pastor's Keeper. 17. Reaper, behold the fields are ripe [white] . Missions. 18. Rise, heart, thy Lord arose. Sunday. 19. Upon the holy mountains high. Security of the Church. iii. From the Leeds Sunday School Hymn Book, 1858. 20. And will [How shall] the mighty God. The Holy Ghost. 21. Jesus, the Lord, our Righteousness. Jesus, the children's Friend. 22. O Thou Good Shepherd. The Good Shepherd. iv. From Dr. Allon's Supplemental Hymns, 1868. 23. My Father, it is good for me. Trust. 24. Thou Who hast known the careworn breast. Evening. 25. Walking with Thee, my God. Walking with God. v. From Mr. Rawson's Hymns, Verses, &c. 1876. 26. God is our Refuge; God our Strength. Ps. xlvi. 27. Lo, a voice from heaven hath said. Burial. 28. Lord, let me pray. I know not how. The Holy Spirit desired. 29. O pallid, gentle, grief-worn face. Easter Eve. 30. Out of the depths, the gulfs, the night. Ps. cxxx. 33. Voices of the deep blue night. The Heavenly Call. 34. With gladness we worship. Public Worship. 1. Come, Spirit of the Lord. From his “How shall the mighty God," in his Hymns, Verses, &c, 1876, No. 43. 2. Each trial hath a gentle voice. Patience and Hope. In the 1880 Supplement to the Baptist Psalms and Hymns. This is dated 1857. It is not in the author's Hymns, 1876. 3. Stand up before your God. All Saints. In the 1880 Baptist Psalms and Hymns this is dated 1865. It is not in Rawson's Hymns, 1876.